Whether you fight for the Galactic Empire, the Rebel Alliance, or the galaxy's mercenaries, reinforcements can bring victory to the most dire situations. Now, you can muster additional squads of Stormtroopers, unleash the fury of an enraged Wookiee, or enlist new forces quickly by purchasing the services of some hired guns. Each figure pack has plenty to tip the odds in your favor, whether you play a campaign or a skirmish. In each expansion, you’ll find sculpted plastic figures to swell your armies, alongside a new campaign side mission and a new skirmish map with two skirmish missions. 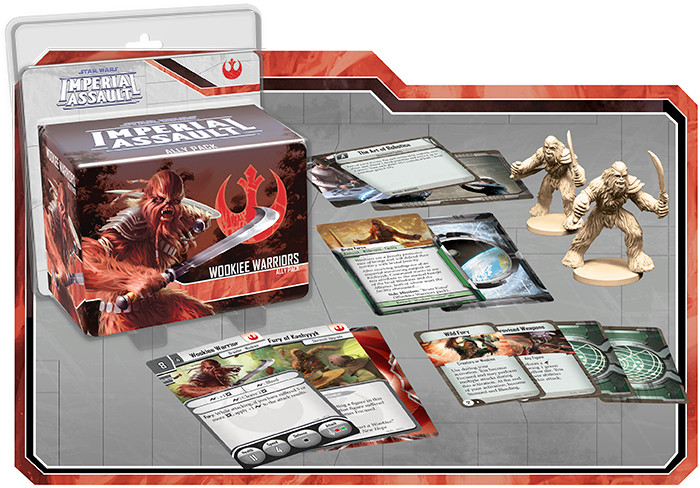 Combined with new Deployment cards, Command cards, Reward cards, and Agenda cards, these figure packs expand your options for any game of Imperial Assault. Unlike other Ally Packs and Villain Packs, these figure packs do not replace tokens found in another expansion. 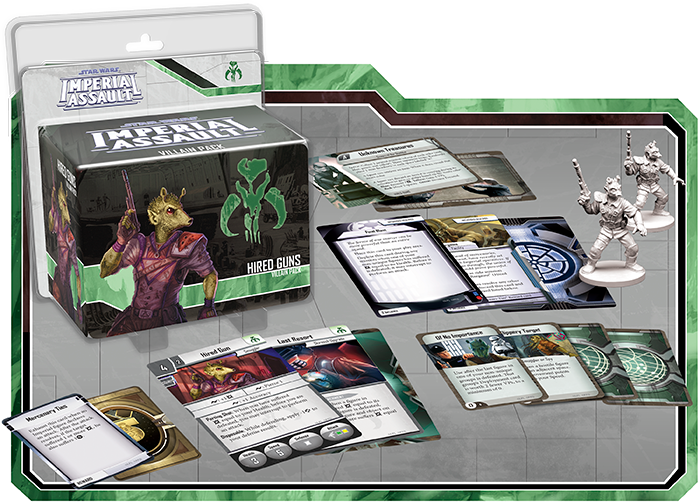 Instead, this wave of Ally Packs and Villain Packs offers brand-new units to introduce to your games of Imperial Assault for the first time! As a slave race under the Galactic Empire, the Wookiees are understandably eager to aid the Rebel Alliance and throw off the shackles of oppression. Natural strength and stamina, combined with combat skills, make every Wookiee a deadly opponent. Two Wookiee Warriors join the Rebel Alliance with the Wookiee Warriors Ally Pack, and they’re prepared to destroy any who stand between them and the freedom of their species. Your skirmish strike teams can certainly reap the benefits of an alliance with the Wookiees. These trained warriors are fearsome in a brawl, and damaging them only enrages them further. The fury of a Wookiee can easily turn the tide of battle, and the addition of the Development Facility skirmish map just gives you more opportunities to demonstrate the foolishness of angering a Wookiee. You’ll also find new Command cards to support your strike team. 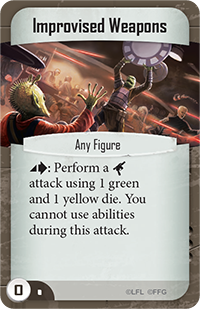 Some of these cards directly benefit your Brawlers and Wookiees, while other cards like Improvised Weapons offer a tangible edge to any figure. 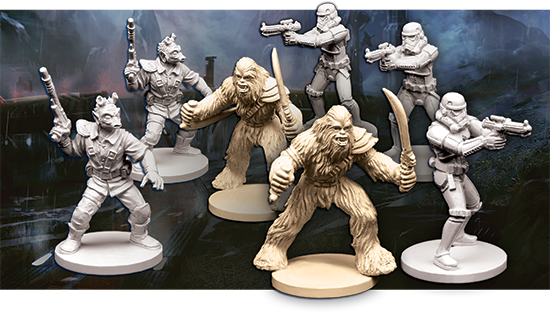 These Wookiee Warriors can also aid the Rebel heroes during an Imperial Assault campaign game. The Brute Force side mission gives you the chance to assault an unethical Imperial facility on Kashyyyk. Then, if your mission was successful, you can call upon the Wookiee Warriors in future missions! Given their prowess in combat, the aid of two Wookiee Warriors may well make the difference between victory and defeat in a later campaign mission. Across the galaxy, there are always beings willing to risk life and honor in exchange for the right price. Now the Mercenaries of the galaxy swell their ranks with some… expendable warriors. You’ll find two Hired Guns figures in the Hired Guns Villain Pack, both ready to pledge their allegiance to the Galactic Empire, the Rebel Alliance, or the highest bidder. A team of Hired Guns can make life difficult for the Rebel heroes in any campaign with the addition of the new Nefarious Dealings three-card Agenda set. You may challenge the heroes to stop a deal from being forged between the Imperials and a group of dangerous mercenaries. If the heroes cannot halt this back-room bargain before the terms are decided, the Imperial player gains the benefits of Mercenary Ties for the remainder of the campaign. Alternatively, you may disrupt trade routes across the galaxy to keep the heroes from getting the supplies and equipment they need. The Hired Guns can prove to be a potent addition to your skirmish armies. Without expending many points, you can gain two disposable warriors to make an opening assault or work as a screen for your more powerful figures. Of course, there’s plenty more content for your skirmishes in the Hired Guns Villain Pack. You’ll find a new skirmish map that invites you to complete two new missions within the sewers of Nar Shaddaa. Four Command cards also allow you to flee from your enemies, or even push them away from victory when they destroy your units! Stormtroopers are the armored fist of the Empire, and are universally feared on Imperial planets. Naturally, Stormtroopers are one of the most common foes faced by the Rebellion, but their intensive training and seemingly-limitless numbers make them a danger to even the best prepared Rebel operatives. 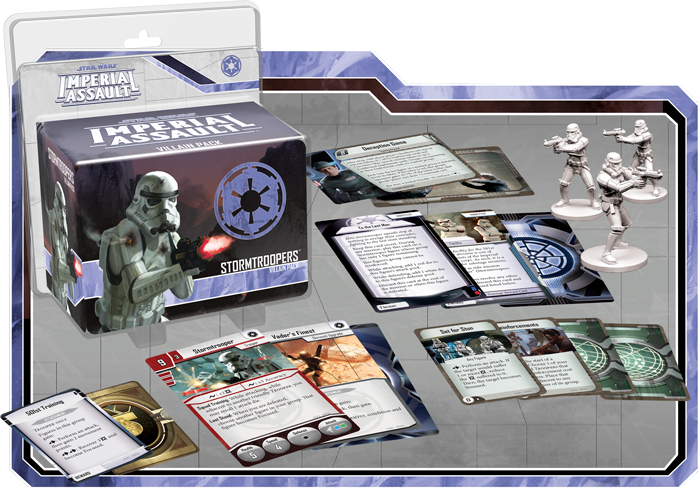 Of course, the Stormtroopers were first introduced in the Imperial Assault Core Set, but the Stormtroopers Villain Pack brings deadly new tactics and abilities to these most loyal servants of the Empire, as well as three new Stormtrooper figures that feature an alternate figure sculpt. In your campaigns, this expansion offers the new Vader’s Fist Agenda set. You may goad the Rebel heroes into an attempt to sabotage the training facility of the renowned 501st Legion. 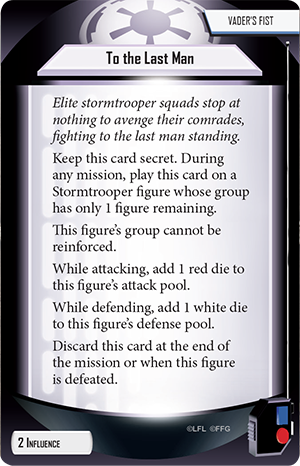 On another mission, you might use the To the Last Man card to massively increase the attack and defensive power of the last Stormtrooper figure remaining in a unit, making this lone survivor a formidable opponent for any hero. You’ll also find new skirmish game content in the Stormtroopers Villain Pack. A brand-new skirmish upgrade represents the training of the 501st Legion, offering two potent new abilities to any Stormtrooper squad enhanced with this card. 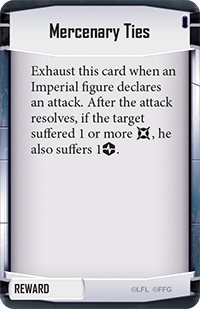 At the same time, new Command cards reinforce figures after they die or invite your figures to engage in stealth tactics. Whether you play a campaign or a skirmish, this Villain Pack easily expands the ranks of your Stormtrooper armies. You may fight for the Galactic Empire, the Rebellion, or the mercenaries of the galaxy. But whoever you fight for, you could certainly benefit from some timely reinforcements. The Wookiee Warriors Ally Pack, the Hired Guns Villain Pack, and the Stormtroopers Villain Pack are coming to your games of Imperial Assault! Prepare for your battles to intensify, and look for these figure packs in the third quarter of 2015.